Situated in the heart of Louisiana’s main business district, and minutes from the iconic French Quarter and Arts District, the Hilton New Orleans St. Charles Avenue is a AAA 4-Diamond hotel dating back to 1926. 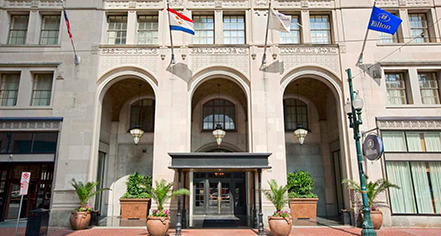 Originally constructed as the Masonic Grand Lodge of the Louisiana, this historic landmark has well-appointed accommodations, an updated lobby, the latest in state of the art fitness equipment, and an expanded Executive Club Lounge. While the hotel experienced a luxurious update, touches of the original craftsmanship and architecture are still evident throughout the hotel. The magnificent ballrooms and meeting rooms were originally lodge halls to the Masons and have been meticulously restored. 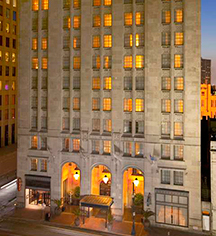 Hilton New Orleans, a member of Historic Hotels Worldwide since 2015, dates back to 1926. Originally the Masonic Grand Lodge of the Louisiana, this magnificent 20-story Gothic Revival story Neo-Gothic style building was hailed as the first skyscraper in New Orleans. Early Check-In/Late Check-Out: Early Departure Fee: $100.00. Late Check-Out Fee: $100.00 late c/o fees will apply based on check-out time. Parking: Self-parking: Not Available. Valet parking: $42.00 (Valet Parking). Secured: Available. Covered: Not Available. In/Out Privileges: Available. Other Parking Information: Parking is managed by PMS. Payment: All forms of payment are accepted. Payment is required at time of booking. Visa, MasterCard, Amex, Diners Club, China Union Pay, Carte Blanche, and Discover are accepted. Transportation: Limo and Town Car service available. Situated in the heart of Louisiana’s main business district, and minutes from the iconic French Quarter and Arts District, the Hilton New Orleans St. Charles Avenue is a AAA 4-Diamond hotel dating back to 1926. Learn more about the History of Hilton New Orleans/St. Charles Avenue .